Katie is no stranger to death, loss, and grief. Her mother died when she was ten, and the Oklahoma City bombing occurred during the early years of her social work career there. It’s about meeting clients where they are individually and as family members, and ultimately applying a macro-level view of their situation, and then empowering them. She considers the hospice setting exactly the right place for her, thanks to her comfort in the medical atmosphere, the opportunity to build relationships, and her experience with death and dying. 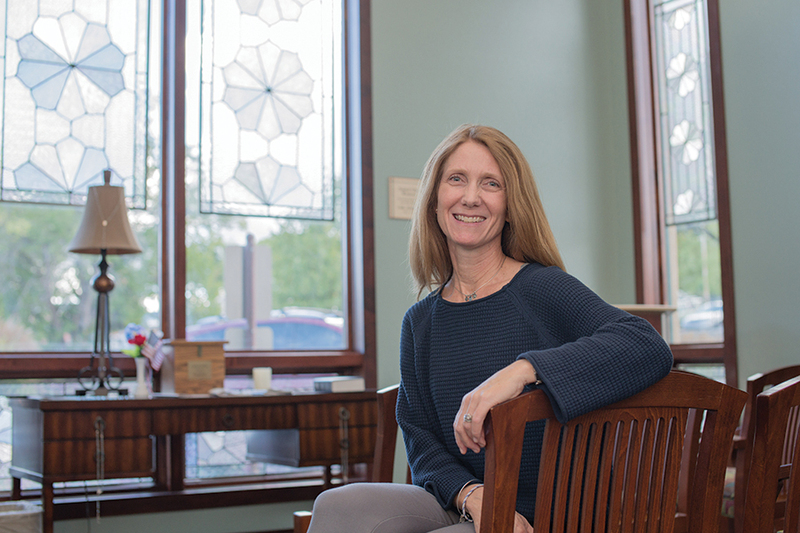 “I love hospice and I’m very passionate about its mission, purpose, and intent”: to enhance the quality of life for people approaching the end of life—and for their family, through resources, services, and support. The answer comes in physical, spiritual, and practical forms, unique to each patient’s needs and desires, whether patients are being treated in their home, at a facility, or at the Marley House, the Good Samaritan Society® in-patient hospice facility. Pain and symptom management are a priority for the team, which includes a nurse, a CNA, a social worker, a chaplain and a volunteer. Social workers and other members of the team identify the patient’s wishes. The staff does its best to help a patient achieve a goal if possible. Once, Katie said, a patient and his wife were expecting a grandchild. He wanted to know the unborn baby’s gender, but his wife wanted to be surprised. The baby’s mother put the information in an envelope, and Katie shared the gender with the patient, keeping the secret for his wife. Another patient wanted to visit her favorite beach one last time. She wasn’t well enough to make the trip, so the staff recreated a beach scene in her room. One couple renewed their wedding vows. Another patient reconciled with a family member. Chaplains help with spiritual needs and goals, and staff members assist families in finding related resources like Meals on Wheels, library audiobooks, and bereavement services. “Hospice is as much about celebrating as it is about grieving,” Katie said. The team members also provide gifts to one another. “We’re truly a collaborative team,” Katie said, and Cathy Delgado, the Marley House Supervisor, said each member of the Good Samaritan Society® Prescott Hospice team is like a piece of a puzzle, fitting together to make a great picture. For more information about Good Samaritan Society® Prescott Hospice, visit https://www.good-sam.com/locations/prescott-hospice or call 928.778.5655.